In order to complete this exercise and gain an accurate assessment of those players from Europe, NHL.com reached out to NHL Director of European scouting Goran Stubb and NHL Chief European scout Janne Vuorinen for their opinion. Both Stubb and Vuorinen admitted there were no top prospects that stood out from Germany, Czech Republic, Switzerland or Norway. 1. Seth Jones, D, United States: The 6-foot-3.5, 208-pound defenseman was already considered a top-two pick at the 2013 Draft prior to the WJC. In seven games for the gold medal-winning Americans, Jones produced one goal, seven points and a plus-8 rating. His six assists led all defenders and placed him in a tie for fourth overall. The native of Plano, Texas, named an alternate captain for the team despite being the youngest player on the roster, also ranked third overall in plus-minus rating. He'll serve as captain for Team Orr at the Home Hardware CHL/NHL Top Prospects Game in Halifax, Nova Scotia, on Jan. 16. Jones has eight goals, 28 points and a plus-27 rating in 31 games as a rookie with the Portland Winterhawks in the Western Hockey League this season. 2. 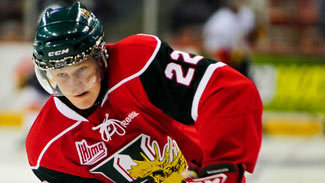 Nathan MacKinnon, C, Canada: The other potential top-two pick in this tournament, he of the Halifax Mooseheads in the Quebec Major Junior Hockey League, had one assist and a minus-1 rating while playing a checking role in six games for fourth-place Canada. There were plenty of eyes on the resident of Cole Harbour, N.S., who was credited with seven shots on goal, and he showed some flashes on a star-studded roster in the early stages of the tournament. MacKinnon (6-0, 182), who has totaled 53 goals and 130 points in 88 career league contests, was named captain for Team Cherry at the CHL/NHL Top Prospects Game next week. 3. Aleksander Barkov, C, Finland: Despite a disappointing seventh-place finish for the Finns, the ultra-talented Barkov performed as expected. A strong two-way center, Barkov finished with three goals, seven points and a plus-2 rating in six contests. Stubb admitted that Finland's struggles as a team did nothing to diminish the draft stock of Barkov, who took 22 shots on goal. Central Scouting's No. 1-rated skater in Finland, has 14 goals, 28 points and a plus-7 rating in 32 games with Tappara in 2012-13. 4. Jonathan Drouin, LW, Canada: The 5-foot-10.75, 185-pound wing was considered a bit of a longshot to earn a roster spot for Canada but the 17-year-old beat the odds and ultimately received a spot along the country's top line alongside captain Ryan Nugent-Hopkins and Mark Schiefele. He had one assist and a plus-1 rating filling in for Jonathan Huberdeau on the top line in Canada's 4-1 preliminary-round victory over Russia. Drouin, who normally accompanies MacKinnon on the top line in Halifax, finished the WJC with two goals, four points and a plus-4 rating in six games. Drouin, who has 19 goals and 48 points in 24 games in Halifax, will serve as an alternate captain for Team Cherry at the Top Prospects Game. 5. Elias Lindholm, C, Sweden: Lindholm left little doubt what the future holds with two goals and four points for the silver medal-winning Swedes. Stubb commented that the 6-foot, 191-pound center is a "terrific skater and on the move all the time." He was usually first on the puck and possesses all the tools required of a potential top-five draft choice. Lindholm, Central Scouting's No. 1 ranked skater from Sweden, has six goals and 21 points in 32 games for Brynas in the Elitserien. 6. Rasmus Ristolainen, D, Finland: Stubb felt the 6-3, 203-pound Ristolainen was arguably Finland's top defenseman. He finished with two goals, six points, a plus-5 rating and registered 17 shots on goal in six games. His six points tied for the team lead among defenders with Ville Pokka, a second-round draft pick of the New York Islanders last June. Regarded as a smart, physical player, he also led the team with 20 penalty minutes. The No. 2-rated skater in Finland, according to Central Scouting, has two goals and 18 points in 29 games for TPS in Finland's elite league, SM-liiga. 7. Ryan Hartman, RW, United States: As a member of the 'Grind Line' for the United States alongside Cole Bardreau and Blake Pietila, Hartman was a pleasant surprise for coach Phil Housley. In seven games, he had two goals, three points, a plus-4 rating and 16 penalty minutes. Hartman offers a tremendous motor and work ethic on every shift. The 5-11, 187-pound forward, who can play both center and wing, has 12 goals, 29 points and 87 PIM in 32 games for the Ontario Hockey League's Plymouth Whalers. 8. Valeri Nichushkin, RW, Russia: According to Stubb, the 6-foot-4, 196-pound Nichushkin "did not really play as expected" but did notch his only goal in overtime of the bronze medal game in a 6-5 victory against Canada. As the youngest player on Russia's roster, Nichuschkin had two points, a plus-5 rating and 25 penalty minutes in six games. He also received a one-game suspension for an illegal hit from behind on Canada's Tyler Wotherspoon on New Year's Eve. "He's big and strong … makes things happen with his skating and surprising moves around the net," Stubb said. "He's still a good prospect even if he was a 17-year-old among 19 year olds at the tournament." 9. Marko Dano, C, Slovakia: The 5-11, 183-pound Dano was an offensive force for the Slovaks, who proved to be a tough out in Group B despite the eighth-place finish. In six games, Dano connected for four goals and finished sixth among all scorers at the WJC with nine points. His 22 shots were tied for second on the team. Dano, according to Stubb, is presently the best pro prospect among the Slovaks and Czech Republic. In 26 games for HC Slovan Bratislava in the KHL, Dano has three goals, five points and a plus-2 rating. Stubb felt Dano played as expected at the WJC. 10. Viktor Arvidsson, LW, Sweden: In six games, Arvidsson had four goals, five points and a plus-1 rating. His 27 shots ranked second on the team behind only team captain Filip Forsberg. "He loves to score, loves to win," Stubb said. "He's a small player (5-9, 172) but was a big positive surprise for the Swedes." 11. Jacob de la Rose, LW, Sweden: Despite having a limited role as a fourth-line player for coach Roger Ronnberg, de la Rose showcased good offensive instincts and is a gifted skater. The 6-2.25, 189-pound wing didn't register a point but accrued 22 penalty minutes. He has four goals, six points and a plus-4 rating in 27 games with Leksand in Sweden's Allsvenskan this season and captained his country in the Under-18 Ivan Hlinka Memorial tournament last August. "He's a physical player who will be drafted high," Stubb said. 12. Robert Hagg, D, Sweden: Hagg, Central Scouting's No. 4-ranked skater in Sweden, came through when called upon to fill a big role along the blue line in the absence of several big names sidelined by injury. He finished with one goal, two points and a minus-1 rating in six games. He was a strong, aggressive and solid two-way defenseman capable of getting off an accurate shot. According to Stubb, "Hagg's draft chances went up after his performance in Ufa." He has nine goals and 20 points in 23 games for Modo in the J20 SuperElit. 13. Anton Slepyshev, LW, Russia: Undrafted last year, the 6-2, 194-pound Slepyshev possesses all the tools but, according to Stubb, "looks good but nothing really happens when he's on the ice." Slepyshev, who played alongside standouts Nikita Kucherov and Mikhail Grigorenko, did post respectable numbers for the Russians with one assist, a plus-4 rating and 17 shots. 14. Alexander Wennberg, C, Sweden: The 6-1, 183-pound forward, ranked No. 5 among skaters in Sweden, was normally on a line with Rickard Rakell and Viktor Arvidsson. He connected for two goals, three points and a plus-2 rating in six games. A North-South type skater, Wennberg has 10 goals and 18 points in 29 games for Djurgarden in Sweden's Allsvenskan this season. "He's not flashy but a very skilled, mature, smart and solid forward," Stubb said. "He likes to go straight for the net and has a quick release." 15. Artturi Lehkonen, LW, Finland: Stubb suggested that Lehkonen's talents were "lost in the tournament" since he played with work horses who never dished him the puck. Still, the 5-10, 163-pound wing, ranked No. 3 among Finnish skaters, produced three goals, four points and a plus-5 rating for the Finns. He was also credited with 16 shots.